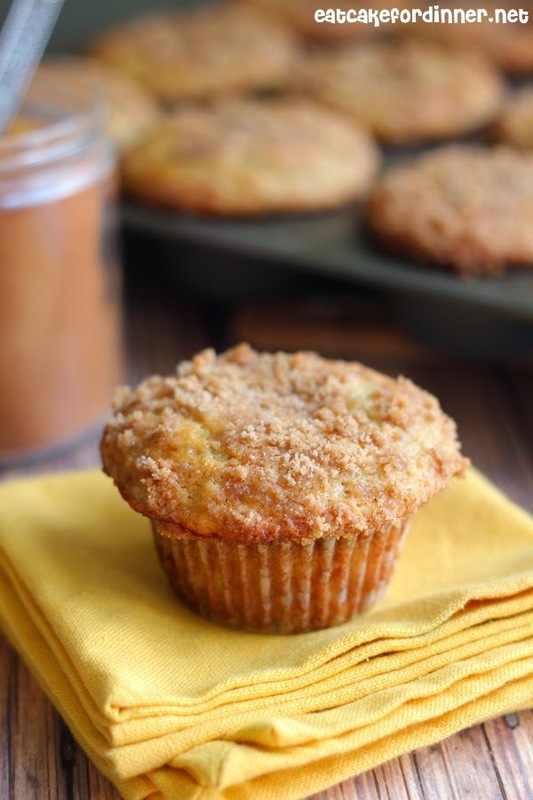 These gorgeous muffins are so light and fluffy with a sweet banana flavor and a buttery streusel topping. They are some of my favorite banana muffins. Can you believe it is November already??? Christmas is next month - say what? Did you guys all have a good Halloween - what did your cute kiddos dress up as? Elsa (from Frozen) was the popular one around here. The weather is getting cold and it's been rainy all day today. A warm muffin right out of the oven is just so comforting. This is the time of year, when comfort food happens quite often in my kitchen . . . muffins, bread, soup, hot chocolate, etc . . . you name it! Preheat oven to 375 degrees. Line a 12 cup muffin tin with paper liners and spray with cooking spray. In a medium bowl, whisk together the flour, wheat flour, baking powder, baking soda and salt. In a separate bowl, whisk together the mashed bananas, yogurt, sugar, egg and melted butter until smooth. Add wet ingredients to dry and stir together until just combined. Use a large ice cream scoop and divide batter between muffin cups, filling 3/4 full. For the topping: Combine brown sugar, flour and cinnamon. Add the butter and using your clean hands, work the butter into the dry ingredients until it resembles wet sand. Divide topping between muffins. Bake for 18 minutes or until a toothpick inserted in the center comes out clean. Makes about 12-13 muffins. Jenn's Notes: If your mashed bananas don't quite equal 1 cup, you can make up the difference with more yogurt. 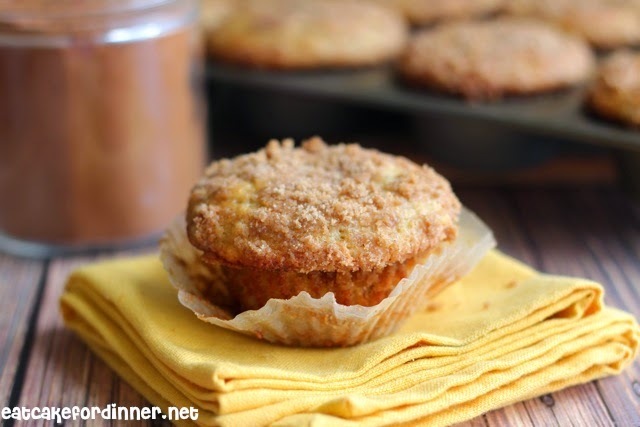 I think these muffins could easily become my favorite muffins too! That is so good to hear!!!! Thanks for letting me know. 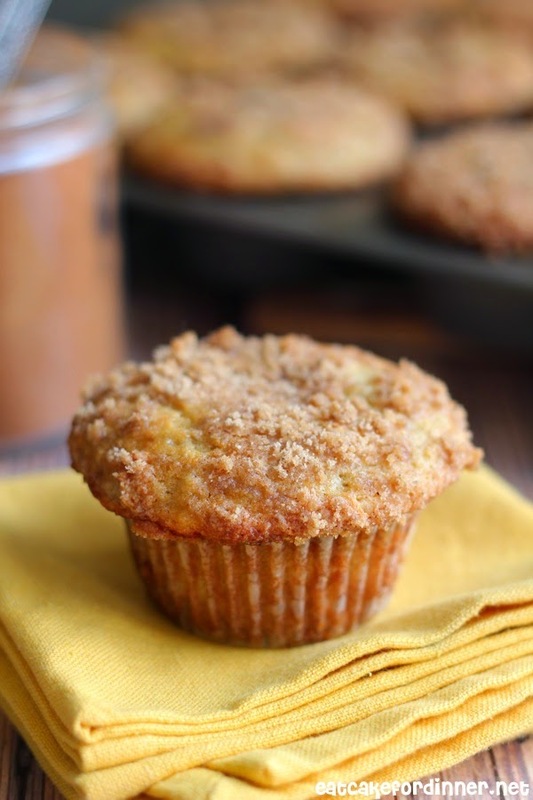 Craving one of these muffins to devour right now - they look SO good.. especially with all that yummy streusel! I bought extra bananas this week to make banana bread and I'm deviating from my normal recipe to make these. By the way, I've used my Pampered Chef large scoop for years to make the perfect sized muffins and pancakes. I'm glad you know that great tip too! You know I have a weakness for muffins Jenn! These look amazing!! These look amazing! I am all about the streusel and yours looks fantastic!